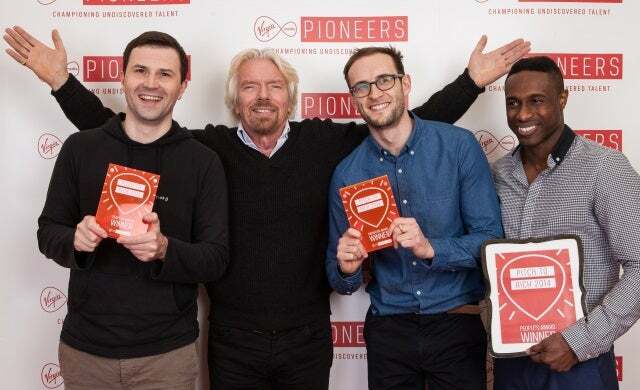 A “novel” box-by-box storage business and an app enabling people to sell their smartphone photos have each secured a £5000 prize package at the Virgin Media Pioneers ‘Pitch to Rich’ event held at Sir Richard Branson’s house in Oxfordshire yesterday. Igor Roberts, founder of early-stage doorstep delivery storage company Boxhug took home the StartUp award for businesses in their first 12 months of trading, and Carl Thomas, founder of miPic won the Innovation Award for his mobile app which helps artists and photgraphers make money from their smartphone image library. The two entrepreneurs were chosen after beating 400 businesses to the final where they, and four other finalists, had to present a 90-second pitch to Branson and panel of high-profile judges including Holly Tucker of Notonthehighstreet.com, Moonpig founder Nick Jenkins, Jack Wills co-founder Peter Williams, and “digital influencer” Dina Toki-O. New to this year’s annual competition was an additional ‘People’s Award’, voted for by viewers of the live stream of the event, which resulted in a draw between miPic and Audiowings; a business which specialises in smart headphones which wirelessly connect to platforms like Spotify. Each award package includes £5000 investment plus mentoring which covers legal advice, branding and marketing, and Innovation Award winner Thomas has also won free enrolment to leading London tech accelerator The Accelerator Academy. The competition, which looks to uncover early-stage talent, was attended by several business experts and entrepreneurs including Ian Merricks of the Accelerator Academy, Start Up Loans’ creative director and former Apprentice winner Yasmina Siadatan, and Startups 100-listed and Young Gun to Watch Jimmy Cregan of Jimmy’s Iced Coffee. Last year’s winners; brothers Joshua and John Okungbaiye, of theft-proof rucksack company High Spirit, were also at the event to share their progress and explained that the “biggest change for our business since winning the award was sales – they’ve gone off the roof”. The ‘Pitch to Rich’ runners-up were Peco Poncho; biodegradable “cool to wear” ponchos, ICanMake; a 3D printing company aimed at schools founded by the former CTO of Moshi Monsters, and Lines; a smart sensor app for skiers. Virgin Group founder, Branson, commented: “This year, Pitch to Rich has showcased even more innovative businesses and it has been wonderful to meet the bright minds behind these ideas. “The winners really stood out for their ingenious businesses. I’ve all sorts of stuff lying around which could really benefit from Boxhug’s storage service and miPic is an impressive way of creating art dealers out of all of us. I am delighted to help champion their vision.